"When Ethan started Vision Therapy, it was our last resort before eye surgery, I chose not to have surgery since Ethan’s problem was his brain working incorrectly with his eyes. After 6 months of therapy, I’ve noticed improvement in his eye control and his teachers said that his reading has improved. 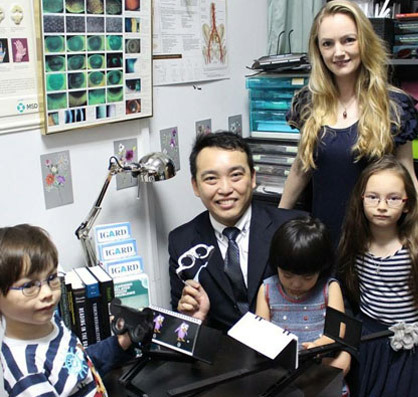 Dr Yap has been amazing and Ethan enjoyed working with Valeria, Rahjee and Mavis." "Audrey’s headaches have gone and she is now able to focus better at school. Her eyeglasses and visual therapy helped her a lot. I wish to thank you and your colleagues in treating her eye problems." "Before the exercise, Stefan sees double vision very often. Now, he sometimes still see double vision only when his eyes are tired. He also feels less headache now." "For many years, I have been told by many doctors that my son’s lazy eye cannot be treated because he is more than 8 years old. But after 7-8 months of therapy, his eyes have stopped turning away when he looks at e and he can focus very well with his school work. Thank you!" "IGARD is the best at what they do and make you feel right at home."